Painting by Gordon Frickers, measuring 40 x 50 cms (15¾” x 19¾”), oils, £1,200 ex studio, ex frame. A bargain and sound investment, unrepeatable, one of the most unusual, outstanding paintings I’ve produced, ex studio ex frame. By the 10 th of august the weather was showing signs of change which we can ‘read’ in this sunset. During a period of several weeks stable very hot weather and drought in the Tarn Province of Midi Pyrenees, France, I’d watched some of the most fiery sunsets I’ve seen. While admiring them as one does I began to think, why not try, Why not, fear of failure? 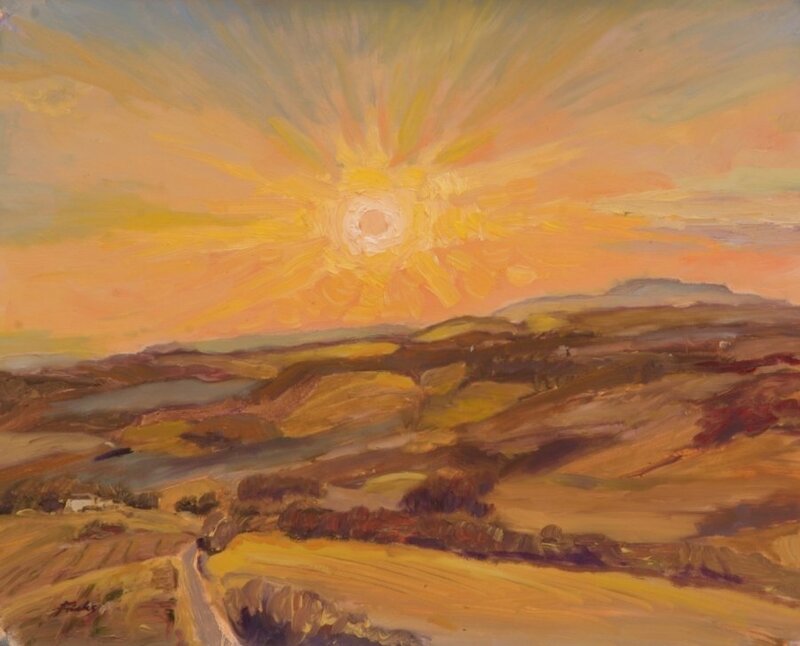 Encouraged by my friend and mentor Francis Pratt of Painting School of Montmiral, this series and ‘Sunrise Project’ each painted spontaneously, most were painted over a period of about a month. Chekhov wrote about the power of narratives, paintings too are narratives, to summon the reader, draw them on. Both the future and the past are narratives.